My husband and I got an amazingly awesome and meaningful cookbook from my oldest sister one year for Christmas. The thing that made the cookbook so special is that it wasn't the kind that you can buy in a store. This cookbook was full of recipes submitted to my sister from all of our family and friends. The fact that my sister took the time to send the recipe requests to all of the important people in our lives and then assembled those recipes into a book is a gesture that makes my heart swell. Each person submitted two recipes and I value each and every one of them because they were hand picked by my loved ones. Which brings me to Jewish Apple Cake, which was submitted to my sister twice. My mother's mother, better known as MeMe (also famous for her spaghetti sauce), chose to share this one with me, as did my grandfather's sister, my great-Aunt Grace who added a side note that she has been making it for over 50 years. My mother told me that it originally came from my great grandmother, so it is definitely one of the treasured recipes we're passing through the generations. I can taste the history in every bite. Preheat oven to 350°. Spray a tube pan with cooking spray. Place flour, sugar, baking powder, salt, vegetable oil, orange juice, vanilla and eggs in a large bowl and mix with a spoon until all of the ingredients are moist. Pour half of the batter into the pan and top with half of the apples. Sprinkle generously with cinnamon and sugar. Repeat with the remaining batter and apples topping with more cinnamon and sugar. My mommy has been making this cake for over 40 years. She got the recipe from a coworker and couldn't remember who. Everyone in my family, community, and church loves it. My Pastor requests it every year on his Birthday, mommy balks but I know secretly she's thrilled to be asked. 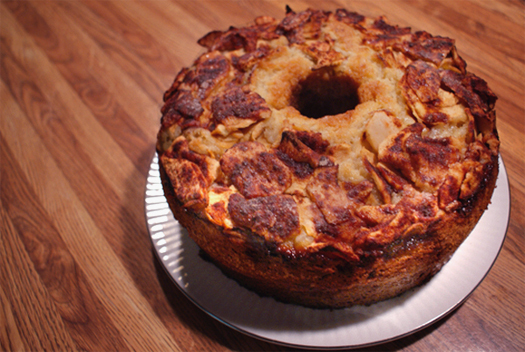 We've always called it simply 'The Apple Cake'. Can the apple cake be made with splenda or equal instead of regular sugar? I'm sure you could, but I have never made the substitution, so I'm not sure if it would alter the taste. @Anonymous, I'm not sure although my mommy's been substituting her baking with those sugar substitutes for a couple years now...I haven't really tasted a difference. Albet I'm not a baker. I will say this not a sweet tasting cake. Good Luck! How many servings for this cake ? I would say at least 8-10 servings. Can it be done in a bundt pan? I don't see why not. If you try it, I'd love to know how it turns out for you!